A while ago I put up a post showcasing adventure game GUIs, without really going into much details about them. 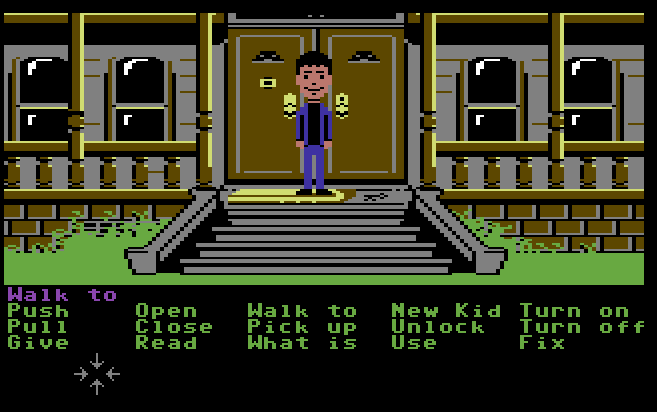 But if you want to make your own adventure game, one of the first questions is how you want to control it. And that means, deciding how many Verbs there should be. If you ask "old-school" gamers, you will hear a lot of complaints that modern games are "dumbed down", while game designers talk about "streamlining the experience" - both positions have some truth to them, because it is important to differentiate between complexity and depth. Let me make a non-adventure game related example: The game of Chess. The game isn't terribly complex - there are only 6 different pieces, and only a few special rules. However, the game possesses a great depth due to the many different options to play it. The game of Go is even simpler, but comparable to Chess in its depth. There are fifteen verbs available. 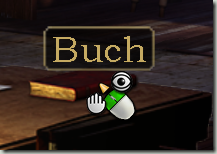 If you play the game, you will notice that you use verbs like "Use" and "Give" quite a few times, while "Fix" is used possibly only once or twice during a play-through, if at all. There is complexity, but do "Unlock Door with Key" or "Fix Phone with Tube" really add more depth than "Use Key on Door" and "Use Tube on Phone"? The problem with that is that it's not just a matter of thinking but also a matter of creating enough content. Having a lot of different verbs - or even the mentioned text parser - means that the game needs to have a lot of responses for invalid actions, or risk boring the audience. If I can "kick the door", I should also be able to "kick the mailbox", "kick the window", "kick the man" and get a better response than I can't kick that. Otherwise, you add complexity, but not any perceivable depth and the game is back in "guess the parser" mode. LucasArts decided to trim down the verb list to nine in the nineties - then even changed the original Monkey Island from twelve Verbs on the Amiga to nine Verbs on DOS (removing Walk To, Turn On and Turn Off). Removing Verbs removes complexity, but it doesn't have to mean that it removes depth. Depth is created by meaningful interactions of the verbs you have. This means that you should create a lot of dialogue - if I push something I can't push, having a more specialized message than "I can't push that" goes a long way, but that's still not actual depth. Actual depth stems from the ways I can solve the game. Do I have to solve the puzzles in order or can I pick which ones I solve when? And are there multiple solutions? Can I Use golfclub on Man to solve the puzzle by force, while also having Give golfclub to Man in order to bribe him as an alternative option? A lot of games these days have a simple two verb system - "Interact" and "Look". These games work nicely with a mouse but also on a tablet (where "Look" is usually a long tap). A lot of the puzzles are inventory or dialogue puzzles, which may make these games more "realistic" (they mirror real world problem solving closer), but also are often shallower. Often, there is only one path through a dialogue tree, or one inventory item that works. I can use hammer on nail, but usually not use screwdriver on nail or use book on nail - even though these are valid real world options in a pinch. And for dialogues, often there are only two outcomes, "fail" and "pass". The bouncer in Indiana Jones and the Fate of Atlantis is one exception that I can think of, where dialogue can lead to him letting you in, him fighting with you, or him dismissing you. In the end, it's important to strike a balance between usability, immersion, and design complexity. Especially if you add translations and voice acting, having more responses and possible solutions increases the required time and money, just to create content players may never see. On the other hand, having more variety and truly different solutions makes the game feel a lot more alive and higher quality. And that's one of the reasons I still think that Indiana Jones and the Fate of Atlantis is the perfect Point and Click Adventure.